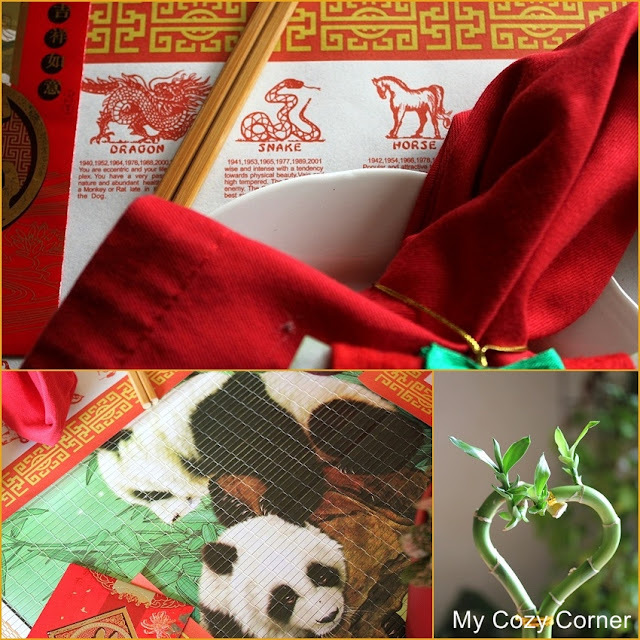 My Cozy Corner: The Year of the Snake! Yes, it's time to celebrate Chinese New Year that begins on the 10th of February. This year's sign is all about ME! My granddaughter and I share the sign of the snake. She was born in 2001. I'm a metal snake, and my attributes are considered to be firmness, rigidity, persistence, strength and determination. The metal person is controlling, ambitious, forceful and set in their ways as metal is very strong; and they are self-reliant and prefer to handle their problems alone. The metal person is also materialistic, business oriented and good at organization and stability. However the metal person can also appreciate luxury and enjoy the good things in life. The Giant Panda is symbolic of China. It is easily recognized by the large, distinctive black patches around its eyes, over the ears, and across its round body. A Pandas diet is 99% Bamboo. The table runner is a 2013 calendar from a local Chinese restaurant where we have dinner occasionally. While having dinner at the restaurant the last time we were there, I asked if I could have four place mats and the calendar. They were very nice and gave them to me. I had the delicious green tea in my tea box and the little red cups were a gift along with a tea pot that looks like a Chinese Tea House. To see The Tea House tea pot Go Here. The Fortune Cookie napkin rings are really Christmas ornaments I made. I have more to finish before our next Christmas sale at church. They have holly decor on the other side, and inside is a paper fortune. The Fortune cookie is a crisp cookie usually made from flour, sugar, vanilla, and sesame seed oil with a "fortune" wrapped inside. A "fortune" is a piece of paper with words of wisdom or a vague prophecy. The message inside may also include a Chinese phrase with translation or a list of lucky numbers used by some as lottery numbers, some of which have become actual winner numbers. Chopsticks originated in ancient China as early as the Shang dynasty (1766-1122 BCE), replacing the fork. The first chopsticks were probably used for cooking, stirring the fire, serving or seizing bits of food, and not as eating utensils. Chopsticks began to be used as eating utensils during the Han Dynasty. (just learned - Chopsticks, when not in use, are placed either to the right or below one's plate in a Chinese table setting). I was in the grocery store shopping and found this Heart shaped bamboo. According to the ancient principles of Feng Shui, these stalks bring feelings of purity and happiness. Carefully cultivated in distant provinces of Asia, the giving and receiving of these plants is a centuries old tradition. By placing Lucky Bamboo in a well-lit room of your home or office, you will achieve the peaceful sense of well-being flows from your "chi" in the Lucky Bamboo. The Lucky Bamboo is shaped in a heart to celebrate Valentine's Day. The Chinese Red Envelope filled with money is given to a young person by an elder as part of the Chinese New Year Celebration. Thanks for visiting My Cozy Corner. I have moved my "Open House" to Thursdays - I hope you will link this tomorrow! Very fun! What a great post! I saw the other day that the new year will be the year of the snake, but I was not sure when the new year started. I think that I am an Ox - does not sound too interesting, does it? Great table - so full of beautiful colors! That's such a wonderful table setting! LOVe that RED. I had to pop over and see the Tea House teapot - it's beautiful! I'm a horse - goodness knows when that year comes around again!